Business Systems & Consultants has been operating for over 40 years, and you can believe us when we say that we know storage. Not only do we understand space design and management, but we care about finding you the best solutions to accommodate every level of your business. 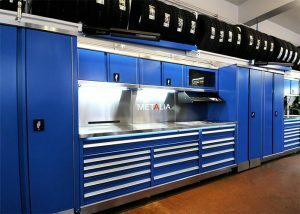 Our storage cabinets are designed to fit your space with the optimal organization and business strategy systems in mind. We’ll ensure that your workspaces go from mediocre from top-notch, prioritizing security and safety for everyone on your team. Here are a few ways that we’ll help you to boost your business productivity in the long run. With any storage unit, form fits function, meaning that we can customize all of our units to suit what you have to store. But what comes first is a specific fitting process that takes your space into account. This assessment focuses primarily on practical design, but we can also accommodate your décor and aesthetics by bringing you your desired stainless-steel cabinets in a range of colors and sizes. We know that the accessibility of your goods can influence overall productivity and this is especially the case in large warehouse spaces and through supply operations with tight production timelines. Our strong and reliable cabinets, shelving, and locker solutions not only protect your valuables but they can also be used to track goods and services. For instance, RFID chips can be installed in various types of storage units to track your valuable products and tools. They can also be used for expensive items such as artwork, archives, weapons, and electronics. We outfit businesses in a range of sectors with a variety of specialized storage solutions, including secure storage units with point locking, RFID systems, fire suppression systems, transmission teardown and rebuild benches, and customized workstations. You may or may not realize that a storage cabinet can be outfitted with a range of specialized features from internal shelving to vertical stacking to pullout sections. All of this will be designed specifically with your staff’s needs in mind. When you think of metal storage cabinets, it may bring to mind old-style filing cabinets with bumpy, heavy drawers which are difficult to open and close. Thankfully this isn’t the case today. We can create various types and sizes of drawer modules for different requirements, even down to the specific measurements of individual items. When you purchase metal storage solutions, you’ll find that they come with a variety of door options, and you can design your cabinets with either sliding or hinged doors. Cabinets can also be purchased to hang on the walls, or to fit into other shelving solutions as pullout compartments. 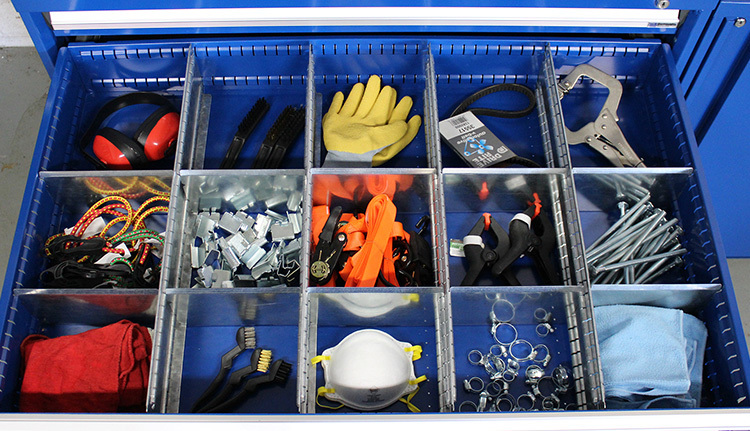 Working with BSC to find metal storage cabinet solutions or other types of storage setups means that you’ll have guidance in every area of the process, from design to construction and even beyond because we train your staff on how to use specialized features. That’s because we care about so much more than just space management. We want you to find solutions that work for your operations, and we want them to suit the needs of your staff, even down to details like décor and aesthetics. Our expert team understands all aspects of engineering and design from the ground up, and they tailor our designs to the needs of companies in a range of industries, including law enforcement, healthcare, and government. When it comes to the installation of specialized storage cabinets, you have our guarantee that the process is fast and clean, leaving you with a functional space to continue doing what you do best with minimal disruptions. We work closely with you to create an exact design, including materials, to meet your needs. Your staff will be able to work in a safe and versatile environment that can adjust and be modified along with the growth of your company. Business Systems and Consultants lead our industry in quality storage, material handling systems, and mobile office solutions. For more than 40 years, BSC has been exceeding the standards of innovation, safety, and quality, and making sure every client is fully satisfied with their installations. Looking for assistance with a custom storage solution? Let our experts help! Contact us any time, and we’ll be more than happy to help.